It was one of the projects that started out with an innocent enough question…. What do you know about light sensors? The answer was not much, but I can find out, if you can give me some context (which is a pretty standard answer from ETS if it’s something new to us). The person asking was interested in measuring the natural light levels at a reasonable number of out door locations in order to help in making a call on if a given activity was safe to continue. The client had already been looking at an existing solution which was using USB enabled light meters being routed over ethernet back to a central location. This felt like a really clunky solution so I was asked to have a look to see if I could come up with something a little different. My first thought was to look at using something with a LDR but that would only really give relative light levels or require a lot of work to calibrate the system. It was time to have a bit of a poke around. The client has a PoE enabled ethernet network covering the site they wish to measure which means I should be able to thuse the a PoE enabled Ethernet Arduino to read from the sensor and report the values back to a central location. 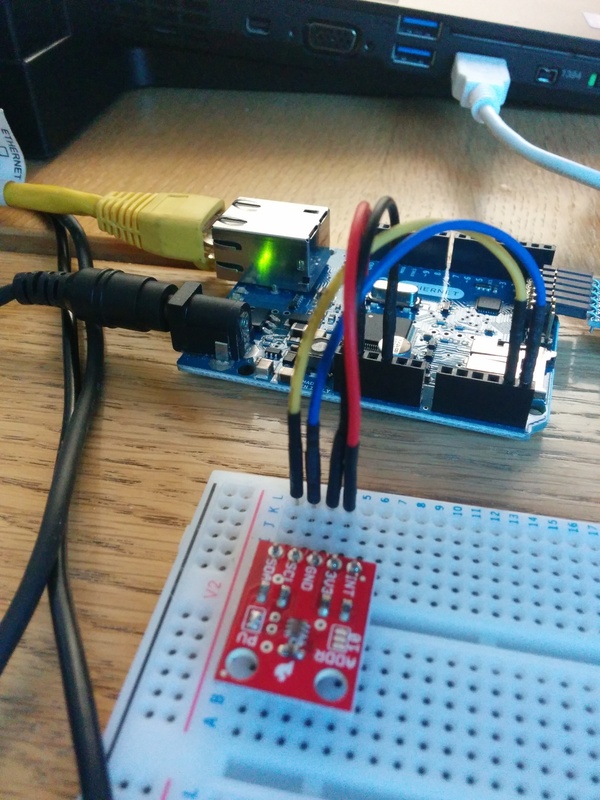 I used the sample library from Sparkfun as a starting point and then extended it with the MQTT client library from Nick O’leary. I threw a prototype together with a breadboard and installed it on the window sill in my office to see how it performed. On the whole it seams pretty good, but I need to find a off the shelf meter that measures in lux to see how the values compare. I now had a sensor that is publishing it’s light levels about once a second, this solved the initial problem but I needed to visualise the results. I fired up Node-Red to take the values and do a few things with them. The chart on the left show the sun coming over the building opposite my east facing office windows then cutting off sharply as it tracks round to the west. The next challenge is to come up with an enclosure for the whole thing so it can survive outside in the British summer.